We talked recently about the burdens of medical debt, and gave you our best suggestions for how to negotiate those expenses. But one pain point of medical debt that doesn’t get enough coverage (sorry for the puns) is the cost of dental care. These costs can certainly be burdensome, especially when we have other debts to pay. What makes matters even worse is that when money gets tight it can become tempting to avoid dental care altogether, which could lead to an even more expensive issue down the line. And any procedure, even the routine ones, can be quite pricey. So today, we are going to take a look at how you can minimize dental expenses while still getting the care you need. And if you do have to take on significant dental costs, we will show you how to manage that, too. If you’re worried about the costs of dental care, don’t just assume that you are left to choose between a hefty bill at a traditional dentist’s office or rotting teeth. Instead, know that there are programs in place to help people just like you, along with other creative strategies and solutions. Here are our favorites. There are free clinics across the country that offer care, and many of these even host events out in the community. You should check out organizations like the National Association for Free and Charitable Clinics and America’s Dentists Care Foundation for starters. Aside from these types of programs and charities, there are likely dental schools in your area. You may be able to reach out to these institutions to see if they offer discounted services as part of their students’ training. One of our employees here at Clearpoint had adult braces in his early twenties, and he found that the cost at a nearby school was about half that of a traditional dentist’s office. They also offered a monthly payment plan and a discount for upfront payment in full. You can use Groupon and other discount websites. We are moving to a world where medical procedures function like most other services in our society. This means that they are subject to competition, and consumers are doing their homework. You can start using this to your advantage by looking for deals and doing price comparisons. We’ve seen Groupon offer dental exams for as low as $49, but you should also pick up the phone and call around. Treat it just like you would a car repair or some other service you “bid out” to third parties. This strategy will be particularly effective for your routine checkups, and you want to make sure to stay on top of these so that you maintain healthy teeth and don’t allow a more serious (and expensive) problem to develop. As you do price research, it will be helpful to know how much basic dental services usually cost. We discussed the concept quite a bit in our main medical debt negotiation post, but you might find that http://fairhealthconsumer.org/ is a great resource for dental costs, specifically. The best way to avoid this is to turn down this sort of care (assuming it isn’t an emergency situation), so that you can do your homework, compare prices, and even get a second opinion. Also, know that some dental insurance providers have relatively low maximums that they will pay in a given year. These maximums might not be enough to cover some of the most expensive procedures like, say, those that cost $3,000 or more. In these cases, you can plan for savings by having the costs split between two insurance periods. Of course, this involves some planning on your part. If the procedure requires two visits, plan one of those just before the end of your coverage year, and plan the other for the beginning of the next coverage year. Doing this can significantly reduce your out-of-pocket costs. Some dental and medical providers no longer offer direct payment arrangements, but it never hurts to ask. The cost may be less than financing on a credit card, and it will not damage your credit if you are late on a payment (unless the provider sends the bill to a collection agency). It is best to ask questions and know all your options before taking action. Also, some dentists have been reported to offer discounts to clients who pay up front. Then, the dentist still bills the insurance as usual and you are reimbursed for the expense. This has been reported to save between five and 15 percent, but it won’t be an option for those who don’t have the extra cash on hand. You can also take out a line of credit with a specialized medical lender like Care Credit. There are a few different financing options, but the most tempting is the one with a zero percent introductory rate. Consumers just need to remember that this is like any other credit card and needs to be managed responsibly. The Care Credit terms would work well with small or short-term dental purchases, but you need to remember to minimize interest accrual. The danger is that many consumers cannot afford to pay off the balance before the promotion expires and if they can only make the minimum payment, the high interest prevents them from paying down the principal. We know this is a frequent problem, because Care Credit is often an outstanding account for clients who come to us for help via a debt management program. Like with any expensive and unexpected purchase, your best defense is to have a dedicated emergency fund in place. Getting routine dental work done should help you avoid the need for major procedures, but it can’t rule out the possibility completely. One of the clients featured in a recent Kaiser study, encountered a difficult period with a variety of medical costs, totaling between $10,000 and $20,000. If this wasn’t bad enough, he then needed dental work done in addition to these expenses, and he had to pay $2,000 in out-of-pocket dental expenses in one calendar year. His situation is the exception to the rule, but it serves as a reminder for how unexpected costs can have major impact on our finances. You’ll want to build up your emergency fund to cover six months of expenses if at all possible. So far we’ve covered what to do in order to keep dental expenses lower and more manageable. But, we realize that this isn’t always feasible, and you might even be dealing with a hefty chunk of debt already. 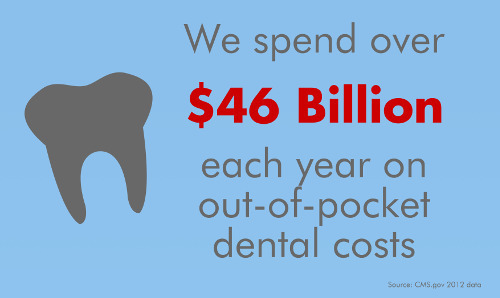 In fact, as a country we spend over $110 billion in dental costs per year, and about $46 billion of that is out-of-pocket expense. So it’s clear that this is an issue for many consumers! Like with other forms of medical debt, you will want to avoid having the account sent to collections if you are having trouble with the payments. Your best bet to do this is to first reach out to the provider and find out what payment options are available. The most basic option will be an affordable monthly payment with little or no interest. By explaining your situation, you may be able to have this payment extended to 18 months or even a 24-month period. If that still isn’t feasible, your next bet will be to ask about hardship programs. Most providers are used to working with patients who have financial difficulties, so they will likely be able to present you with other options. You’ll have the best chance of success here if you can document your income and overall financial situation. The theme here is that you will want to communicate your situation clearly while also paying as much as you realistically can afford. One pitfall will be interest, which might accrue in some repayment scenarios, especially if you finance the costs through something like Care Credit. When interest comes into play and affects your ability to repay, that’s when you might consider a debt management program. Regardless of where you are in the repayment process, if you feel like you are stretched too thin you can probably benefit from a nonprofit budget and credit counseling session, which will help identify the best ways to manage these costs and help you discover other improvements to your budget. Our counselors will be happy to help you with this process, so get started today!